Receptor family annotations are taken from Reference 3.
interest. For the biogenic amine receptors, including the histamine, serotonin, muscarinic, and dopamine receptors, p2AR or the highly similar PiAR are clearly superior templates relative to bRho. The sequence identity between P2AR and the human D1 dopamine receptor is 44.2% in the TM helical domains, and 66.7% when considering only the ligand binding pocket. In comparison, the sequence identity of bRho to D1 within the TM domains and ligand pocket is 20.9% and 9.5%, respectively. For other target receptors, the optimal template choice is less clear. For example, both bRho and p2AR display approximately 20-25% SID to the human type 2 angiotensin II receptor. Despite relatively low sequence identities, several key sequence/structure motifs conserved among the Class A GPCRs can be used to reliably align the TM domains. When creating a sequence alignment for homology model construction, care should be taken that these motifs align and that gaps are not introduced within the TM domains (Fig. 15.1b). A good overview of these conserved GPCR microdomains and a general homology modeling procedure is provided in Patny et al. .
Alongside sequence identity, differences in receptor activation state, helix position, and loop conformation, all affect binding pocket architecture and should be considered during template selection. The structures of bRho cova-lently bound to the full inverse agonist retinal, P2AR in complex with the partial inverse agonists timolol and carazolol, p1AR in complex with the antagonist cyanopindolol, and AA2aR in complex with the antagonist ZM241385 are all consistent with the inactive conformation. As described previously, VLS trials conducted with these structures, or homology models based upon them, may then be biased toward antagonist compounds [51, 52]. In contrast, the 2.9-Â structure of unliganded bovine opsin and the 3.2-Â structure of opsin in complex with a C-terminal peptide of the Ga protein subunit are thought to represent an activated conformation. In both structures, TM5, TM6, and TM7 undergo large rearrangements. Most prominently, the intracellular end of TM6 pivots outward from the helical bundle by approximately 6 Â, allowing interaction with the C-terminal Ga peptide. The helical movements serve to widen the ligand binding pocket, and the overall pocket volume (as calculated using the ICM pocket finder utility ) is expanded to 446 Â3 from 425 Â3 (Fig. 15.4). Models created using this structure as a template are then anticipated to accommodate slightly larger ligands, and perhaps provide a more accurate description of the agonist-bound receptor state. affect distance- and angle-dependent hydrogen bonding interactions, resulting in incorrect ligand docking. Further, the conformation of ECL2 is dramatically different between the bRho/opsin structures and those of p1AR/p2AR and AA2aR. In both bRho and the unliganded opsin, ECL2 forms a P-hairpin structure that caps the ligand binding pocket and partially protrudes into the TM helical domain. In p1AR and p2AR, ECL2 is in an a-helical conformation tethered away from the binding pocket by an additional disulfide bond between Cys184 and Cys190. The open conformation of ECL2 observed in p1AR/p2AR expands the calculated volume of the ligand binding pocket to 1081 A3 relative to 425 A3 in bRho (Fig. 15.4). While most p1AR/p2AR ligands are accommodated within a well-defined lower pocket of the binding cavity (further within the TM bundle), longer ligands may occupy the top portion and form more extensive contacts with ECL2. Of the present GPCR structures, AA2aR is the only one to describe direct interactions between ECL2 and ligand. The antagonist ZM241385 forms a pi-stacking interaction with loop residue Phe168 and a hydrogen bonding interaction with Glu169. Interestingly, the conformation of ECL2 in A2a lacks the secondary structure elements seen in bRho and p1AR/p2AR, but is constrained by a series of three disulfide bonds. This loop, like that of p1AR/p2AR, forms an open structure that increases the solvent accessibility of the ligand binding pocket. In selecting a homology modeling template, known mutagenesis and SAR data can serve to define elements of the expected binding pocket geometry and guide the choice of a template more likely to capture previously experimentally defined interactions. 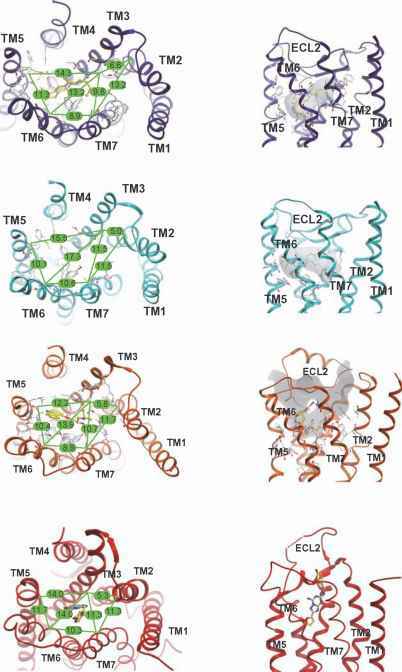 Figure 15.5 Comparison of p2AR ligand binding pockets from a rhodopsin-based homology model and the p2AR crystal structure. Panel (a) depicts the homology model, panel (b) depicts the crystallized conformation, and panel (c) depicts the superimposed structures. For all three panels, the receptor is shown in gray ribbon and (-)-carazolol in yellow or green sticks. TM6 is omitted for clarity. 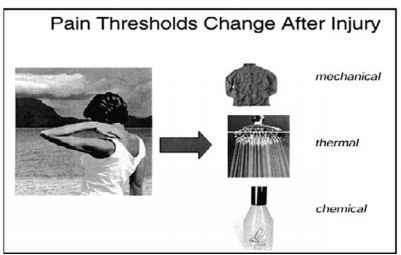 conformations . Importantly, it was found that the conformation of ECL2 in bRho was prohibitive for correct carazolol docking. If ECL2 was modeled using bRho as a template, a 3.7-A RMSD was obtained between heavy atoms of the docked and crystallographic carazolol conformations. When the ECL2 conformation was instead predicted by a de novo protocol that removed the loop from the ligand binding pocket, the ligand RMSD was improved to 2.9 A. Similarly, we have constructed a bRho-based p2AR homology model using standard sequence alignment and homology modeling procedures within ICM (Fig. 15.5) . The backbone conformation of bRho was kept fixed, including all loop regions, and ligand- directed refinement of the binding pocket side chains with fully flexible (-)-carazolol was performed to optimize the ligand binding pocket conformation. Following refinement, the total binding pocket RMSD between the crystal structure and homology model is 5.3A - when all ligand and receptor side-chain heavy atoms within 4 A of the crystallographic conformation of carazolol are included. The RMSD for carazolol alone is 3.7 A. In the homology model, carazolol is shifted away from the extracellular part of the GPCR and placed deeper into the TM pocket, as a result of a clash between Tyr185 in ECL2 and the crystallographic conformation of carazolol. Additionally, due to the increased distance between TM3 and TM5 in bRho, carazolol is shifted toward TM5 to allow simultaneous hydrogen bond formation with Asp113 and Ser203. Accordingly, when the VLS performance of the bRho-based p2AR homology model and p2AR crystal structure were compared, the homology model was found to attain far lower enrichment factors and yields (Table 15.2). These results highlight the inadequacies of the bRho backbone as a homology modeling template, both in the region of ECL2 and in the overall positioning of the TM helices. Other GPCR homology models, whether based on bRho or p2AR, may suffer from similar discrepancies in correct conformational prediction, particularly for the highly flexible and sequence variable ECL2. Removal of this loop is one means to reduce con-formational uncertainty in this region of the receptor structure; this approach and others are discussed later in the next section.